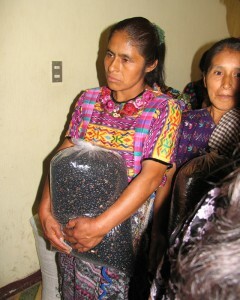 Also located in the 1980’s war-ravaged area of Chimaltenango where GOD’S CHILD Project founder Patrick Atkinson led war-zone reconciliation and post-war reconstruction efforts from 1983 – 1989, the “Sumpungo War Widows Food Distribution Program” was begun by Mr. Atkinson to, literally, feed the widows who had lost their husbands, male children, and farm land in the armed conflicts. Many of these Mayan Indian women suffered not only violence and loss of their families and resources, but were also sexually assaulted, tortured, and suffered war-violence originated post-traumatic stress disorder (PTSD). Our “Sumpungo War Widows Food Distribution Program” effort works hard to provide for the basic needs of this now-aging widowed population. ANA staff and volunteers collect and distribute to these isolated widows donations of clothing, fruit and vegetables, blankets, and housing materials and repair assistance. Your prayers, love, and financial support for these women, and your understanding of all they have experienced, is much appreciated.